Getting ready for the tear down... what to do before? › Getting ready for the tear down... what to do before? As a newbie here (and with Mustangs), I figured before I dive in on my restore/rebuild I should ask some high-level questions. The big one facing me first is: what should I do before I start taking it apart? That is to say, it runs, so before I put it on stands and start the full tear down, what should I be sure to do before it's too late? I'm already going to do a compression test, just for a "pre vs post" comparison and to get a sense of the engine's condition. Are there other things like that I should consider doing? I welcome any advice on this. Thanks! 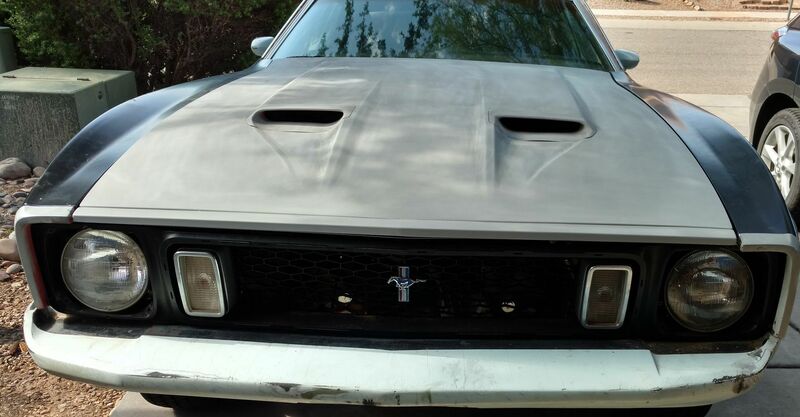 BTW, it's a '72 vert (see attachment) that looks like it was previously modified/rebuilt to some degree (for example, some previous owner add the Mach 1 "stuff"... still not sure what all that is... but I know now that Ford didn't make a '72 vert Mach 1). My goal (at this point... subject to change) is to strip it completely down, make sure the frame/body is all in good condition (doing whatever rust repair necessary... hopefully minimal), probably remove all the paint, and then rebuild/restore little by little, trying to keep whatever works and replacing/rebuilding what doesn't. I'd say you are headed in the right direction. I'd check the engine first. How's it running would be my first check. Any major issues - lose of power, knocking, leaks, etc. Compression test is great. Could scope it if possible (get a good look inside). I'd also check the training, rear end, transmission, suspension. Do you plan a total dis-assembly? If not, I find it a lot easier if to have the car mobile while doing any projects. The car looks pretty solid . I'm with timsweet, I'd keep it as drive able as possible during the rebuild. I was driving mine around with the interior gutted except for a drivers seat and steering wheel............ . Of course it was off the road during engine replacement and body work/paint. But being able to drive it around while doing other projects and in between them was a real motivator. I've seen many projects get totally torn down and then be sold off in buckets years later, when they never got put back together again. That being said, the best thing I did for every project was to take a million pictures of whatever I was working on before starting that project and having them available when putting things back together. I also used color coded zip ties on wires and hoses so that it was easy to see what hooked back up to what. Even with all of that,, I still have parts laying around that I don't know where they go 19 years later. Don't throw anything away! You just don't know when you need that screw or clip to make the new part work. +1 make tons of pictures! The order in which you put things apart is very obvious the moment you do it, but somehow months or years later, its less obvious. Organise/save the picts on your computer. Try keep the hardware of each specific parts together. Keep bolts/washers in small plastic bags/envelops and stick them to the main parts. Some rusty bolts/nuts may look nothing/useless and you think you can buy/find new ones... Just keep all. drsharp, why would wanna take her apart looking so nice? I would get rid of the Mach 1 decals and drive her until she really needs some work. But if you have seriously rusted out areas and or other issues then that should be addressed. +1 on pictures and bagging/labeling everything...especially the hardware. If you're going that route then do one area/section at a time. Although it's easier to do a full restoration and be done with it. And video. I find video to be more helpful than pictures in some cases, especially if I am narrating. Try to keep them organized in folders. As everyone has stated pictures pictures pictures. Do not depend on your camera's storage device always make another copy to DVD or portable hard drive. I am sure there is rust in the cowl never seen one without. If rust in the floors I would go with a full floor replacement easier than doing patches and quicker. Before you take much apart I always suggest you take the car to a frame shop and have them check it and pull in spec before you start. A fantastic investment is a rotisserie. You should not do floor replacement on rotisserie better to have on a chassis stand or something to keep the chassis level. I have a rust free California vert and when I lift it correctly on a two post lift the body bends enough that the doors do not want to open or close. This car is rust free and bends. It is physics equal and opposite reaction, they bend. On the drive train yes verify condition now. You can do tear down later and have the block, crank and head magna fluxed to check for cracks. I would not do the build until you have your body almost ready. An engine sitting for a long time and not getting rotated will sometimes cause issues. It is amazing how much space all the parts will take up. Be sure and look for your build sheet under the carpet, stuffed into a seat frame and sometimes even under the dash. There can be several. Here is a picture of a perfect build sheet I was never so lucky. When buying parts 71 & 72 have lots of differences than 73 so be careful and know what you are buying. NOS does not mean perfect either. I would suggest not to buy any NOS rubber parts as they will not be any good anyway. Metal is ok but will probably have dents or distortion for years of storage. Don't get too hung up on making things you do not see perfect. No reason to they were not perfect when new. I find that doing the worst jobs first makes the build go much better by it getting easier all the time. Knock out the difficult tasks and easy just falls in place. Another reason to leave the engine and drive to last they are easy just bolts and pieces. I took a 72 parts vert apart last year and to give you an idea of time it too about 30 hours. I did bag and tag everything and did not use power tools except for some stuck bolts. I was 69 when I did it. I use to be able to do in two days, for a 65 vert. lol. Be sure you have about 2x the storage space that a car displaces to store parts, bags, etc. Take your checkbook out to a fresh pasture and fatten it up before you take it to the slaughter-house. You want it 3x what you forecast the costs to be.